Friends! We are so close to the start of the college game day season! We are sooooo close! To kick-off my game day season I headed to Morgantown, West Virginia (heaven on earth). I graduated from West Virginia University back in 2008 with a Masters in Sports Management. Not only was Morgantown the place of where I established my love for football, but it’s where I started Sportsanista. My memories of Morgantown are extremely fond and Ill always hold it near and dear to my heart. 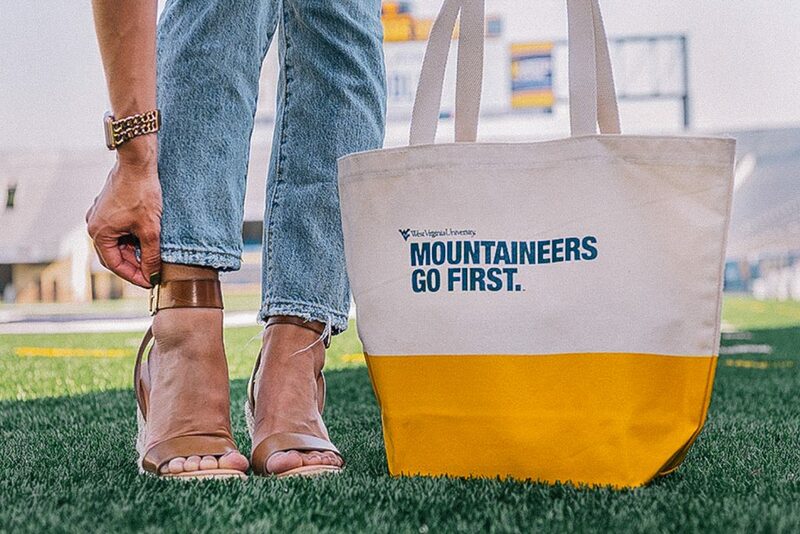 In search of game day fashion and football, I found myself at the Mountaineer Athletic Club Ladies Huddle event. 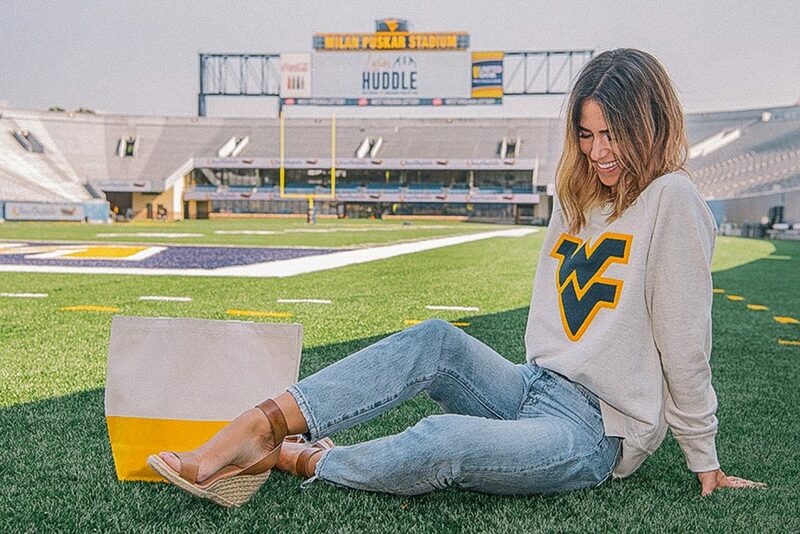 West Virginia University invited back to Morgantown to take part in the event and spread a little game day fashion knowledge. The event start with a trunk show from all the licensed logo vendors – I was dying over everything and needed self control walking through the show. I fell in love with the vintage look and feel of League Outfitters…which brings me to my look for the event. I styled this striped League Outfitters tank with my favorite high wasited denim from H&M – they are the perfect combo for fall! I love taking game day fashion and styling it with trends from the season. Side note – here’s to mom jeans never going out of style. Amen! My favorite piece from the League Outfitters collection is this vintage letterman sweatshirt – the Ivy League look and feel and tugging on my heart strings. Not to mention it’s a SUPER cozy sweatshirt. Retro Brand was another favorite brand of mine that was there. 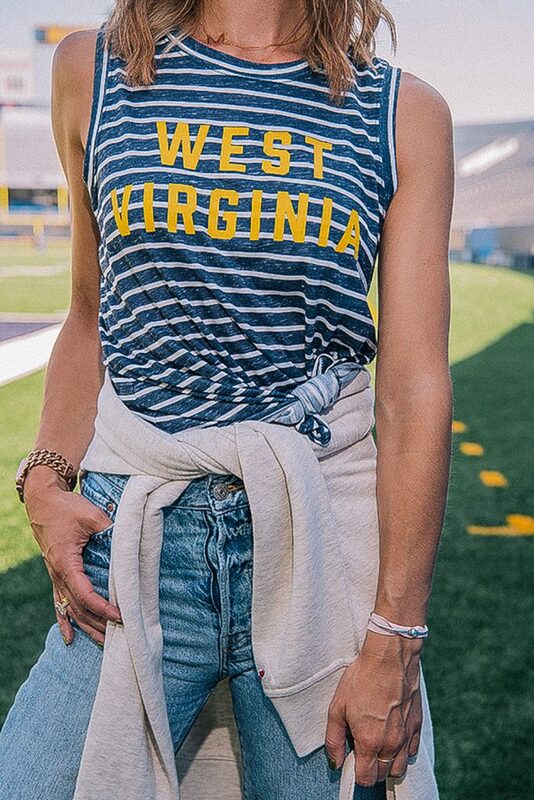 They are one of my go-to brands for college game day fashion with their vintage cotton tees, lace-up detailing and distressed cotton. To shop League Outfitters and Retro Brand check them out here and here! After the shopping ended, we headed outside for the football skills session! I have never felt more like a kid than I did that day! Everyone got the experience to live a day in the life of a college athlete and test their skills on the field! I was seriously impressed by the skills these ladies had – never under estimate a women thats all I have to say! Stay tuned for more game day posts this week! Coming up I have a DIY Tailgate in your car and the perfect look for College Colors Day! Love the letterman sweatshirt but unable to find the link to purchase.